The Render command renders the model using the current renderer producing a color image in a separate display window. On the Render menu, click Current Renderer. Choose the renderer from the list. The materials assigned from the Materials panel to either with the Properties command or the Layers determine the colors of the rendered objects. 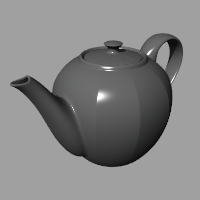 If the objects you are rendering are very complex, Rhino may be slow to shade or render them the first time. It is during that time that Rhino calculates from the smooth geometry a hidden mesh that is used for the rendering. The next time you render the same model, the performance will have improved. In addition to shaded previews, Rhino provides full-color rendering with lights, transparency, shadows, textures, and bump mapping. 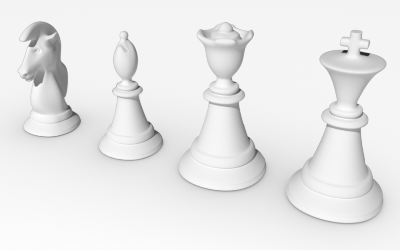 Objects will render white until you add render color, highlight, texture, transparency, and bumps. These attributes are controlled through the Properties panel, Material page. Although the steps do not have to be done in this order, using this method seems to make setting up a scene more efficient. To improve quality, repeat these steps until the image looks right to you. In every Rhino rendering there are light sources that Rhino uses to calculate how the objects are to be illuminated. If you do not add any light sources to your scene, the default light is used. The default light is a directional light with parallel rays that acts as though you have a lamp shining over your left shoulder. Insert Spotlights, Directional Lights, Linear Lights, Point Lights, or Rectangular Lights. Or turn on the Sun. Materials specify the color, finish, transparency, texture, and bump for use by the renderer. In the Choose Layer dialog, select layers. 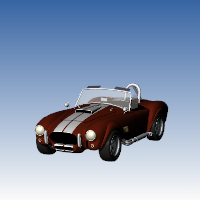 Select an object in the viewports to assign the material to the object's layer. Select one or more layers by clicking their names. Click in the Material column of a selected layer. In the Layer Material dialog, select or create a material. Type a letter to navigate to the first material in the list with a name starting with the letter. In the Materials panel, right-click on a material and select Assign to layers of Objects. Drag a material from the Materials panel and drop it onto a layer in the Layer panel. In the Materials panel, right-click on a material and select Assign to Objects. In the Properties panel, click the Material button. Select or create a material from the drop-down list. Drag a material from the Materials panel and drop it onto an object. The object highlights when the cursor is over it. Environments describe the space around the model. This space is reflected in objects and can provide overall lighting. 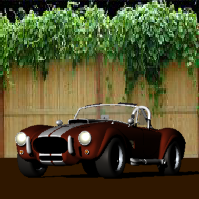 The rendering properties include environment settings like background color and image. Open the Environment Editor panel. The ground plane provides an infinite horizontal platform for the image that stretches to the horizon in all directions positioned at a defined elevation. 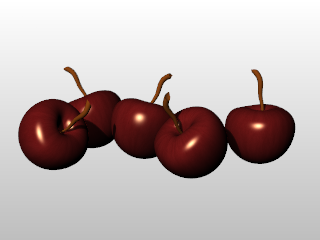 A ground plane renders much faster than using a surface as a background. Any material can be assigned to the ground plane. Open the Ground Plane panel. Set up ground plane properties. Render and save an image. On the Render menu, click Render. In the Render Window, on the File menu, click Save As. If there are textures referred to in the model that are not on your system, a dialog box provides a list of the missing textures. This setting must be enabled by checking the Check for missing textures when rendering box in Rendering Options. Saves the list of missing textures to the Clipboard. Saves the list of missing textures to a text file. Continue to render without the missing textures. Stop the rendering in order to locate the texture files. Click one of the resources in the list to display usage information. Turns off the dialog display. Check the Check for missing textures when rendering box in Rendering Options. Shows where the resource is being used. Allows browsing for a different file or folder location. Rhino Render can save .rimage files. This is a proprietary file format that stores all of the information rendered by the rendering engine, including color, alpha, depth, normal channels, all with 32-bit per-channel resolution. This information is used by the render window to execute the post-effects and exposure operators, and can also be used by custom controls implemented by a third-party renderer to achieve other effects. Immediately after render time, the .rimage format can be used to store the data so that post-processing and exposure adjustments or format changes (saving in a different format without loss of information) can be done later. The .rimage format is only supported by the Rhino render window. It cannot be loaded into any other software. It is a high-dynamic range format that supports lossless information transfer to .HDR and .EXR formats. It is uncompressed and the files can be huge. In the Rhino render window, on the File menu, click Open. Use the RenderOpenRenderImage command to open an .rimage file without having a render window open. Completed renderings are saved in the .rimage format to a temporary location on your hard disk. Once one of the renderings is re-opened, all post effects and exposure settings are available as if the rendering were just completed. In the Rhino render window, on the File menu, click Recent, and then choose a file. The files are named the by date and time of the rendering. For more information about post processing the rendered image, see: Post-processing rendered images. The RenderArctic command sets everything to white - materials, skylighting, ground plane and renders the current viewport. AffectMaterials Turn off to exclude materials from the settings. AffectLights Turn off to exclude lights from the settings. AffectGroundPlane Turn off to exclude groundplane from the settings. AffectBackground Turn off to exclude background from the settings. The CloseRenderWindow command closes the render display window. This is useful for doing multiple renderings. When combined with the SaveRenderWindowAs command, you can create multiple renderings and save them to different files from your script. The CopyRenderWindowToClipboard command copies the image in the render window to the Clipboard. The RenderBlowup command renders a selected area of the current viewport in the render window at the resolution specified in the Rendering panel. The RenderInWindow command renders a selected area of the current viewport in the render window at viewport resolution. The renderer uses the settings in Mesh Document Properties. The Rendering command opens the Rendering panel that provides quick access to the Render Document Properties. Sets the current renderer. This can be the built-in Rhino Render or a plug-in. Specify a source for the view. Select a viewport to render from the list. Select a named view to render from the list. Select a snapshot to render from the list. The aspect ratio displays to the right of the menu. Renders the active viewport the active viewport using the pixel size of the viewport. 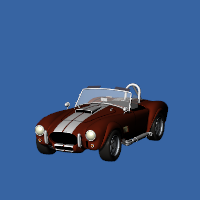 Renders the active viewport using the custom resolution. Type the custom width and height resolution in pixels. Renders the active viewport the selected pixel resolution. If you add a text file named render_sizes.txt to the folder where the Rhino executable (.exe) resides, Rhino Render and some other renderers will read this text file for custom render sizes. Maintains the aspect ratio of the viewport. When the height or width is changed, the other dimension changes in relation. Calculates the size of the image in the selected unit system based on the Resolution and DPI ("dots" per inch) settings. This is useful for determining the size of the image for printing. Sets the image size in pixels, inches, millimeters, or centimeters. Image pixels ("dots") per inch. Jagged edges and moiré problems. Noisy "grain" when using the Skylight, Polish, and Frost settings, rectangular and linear lights, and depth of field. Grain problems on high contrast textures viewed from distance. Higher quality settings result in more rays being cast per pixel, and as a result the rendering time will increase. Prefer lower quality settings when setting up your scene, but higher settings when producing a final image for presentation purposes. Quality=Draft quality (left), and Final quality (right). Rhino calculates each pixel in the rendered image by averaging several samples. This makes the image appear smoother, but also slows down rendering. The backdrop is what you see directly in front of the camera if there are no objects in the way. The background is not 3‑D — it exists only on the screen. Displays a two-color gradient. The color for the top of the image background is the Solid color set above. Displays the portion of the current environment that the camera sees in the viewport. Creates a new environment using a template from the library. Copies the selected environment to a new environment with the same settings. Displays the current viewport wallpaper. Fits the wallpaper to the rendered view. 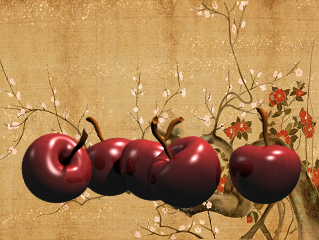 Wallpaper at normal aspect ratio (left) and stretched to fit (right). 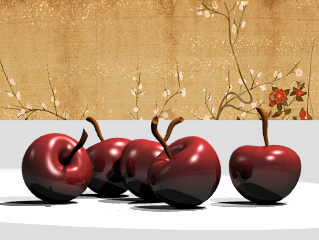 The background is rendered with an alpha channel for transparency. The image must be saved to a file format that supports alpha channel transparency (.png, .tga, .tif). Turns on the ground plane. Opens the Ground Plane panel. 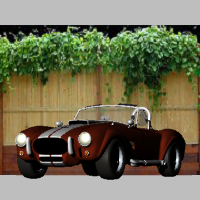 Assigns a custom environment that will be reflected by objects in the scene. The No environment setting applies a plain gray background. The Studio environment offers soft lighting provided by a high-dynamic range image. Studio lighting example (left) and hdr background (right). Skylight off (left) and Skylight on (right). Sets an environment that is used as sky light. Controls whether or not spotlights that are on hidden layers or that are hidden with the Hide command are rendered. 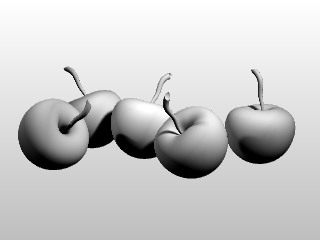 Curve objects are rendered with the surfaces. 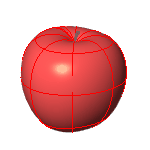 Surface isoparametric curves and edges are rendered with the surfaces. Edge thickness set in the Rendered viewport apply. Dimensions and texts are rendered with the surfaces. The rendered image is usually produced at a higher color depth than monitors and low-dynamic-range file types like bitmaps like JPEG, PNG, BMP can reproduce. The most important effect this causes is banding, which is a quantization error. Dithering reduces quantization errors and so gets rid of banding. Both dithering methods, generally do the same thing. Sometimes, one might be better than the other, but in general, Simple Noise is the best. The algorithm achieves dithering by diffusing the quantization error of a pixel to its neighboring pixels. A random variation of brightness or color information in images. Image files are color corrected so that they can be loaded byte-by-byte into the RGB pixels of a computer screen and look right on a monitor. This means that the color response of a standard image is non-linear, that is, it is gamma corrected. Gamma refers to the power function that is used to correct the image. The Gamma value changes, and therefore corrects the output of the image. The Rendered display mode supports a linear workflow for accurate color, gamma and lighting computation. Gamma correction for bitmap images that are loaded from disk is removed (by the inverse of the amount in the Gamma edit box) so that they have a linear response before they are passed to the renderer. The renderer renders them in this uncorrected state. The gamma correction is applied to the entire finished image. This can do a better job of processing the color in rendered images. See: What is linear work flow and how can it help your renders look better. The width and height of each grid cell in pixels. The smaller the grid cell size, the more memory it takes and the more memory it takes to build, but the faster the final render. The shadow ray is the ray shot from the scene towards each light when the intersection between the eye ray and the scene is found. Usually the lions share of the render time is spent tracing the shadow rays. To increase calculation speed for the spotlight shadow rays, the render plug-in divides the spotlight cone into rectangular regions, and again builds a sorted list of the objects within each region. This speed increase only applies to spotlights, because they are very similar to the viewports, the light location is like the camera location, and the light cone defines the viewport. The spotlight grid is defined in number of grid cells instead of pixels, because there is no pixel size associated with lights. 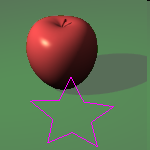 Prevents self-shadowing artifacts. When the intersection between the eye ray and the scene is found, the intersection point is moved (offset) towards each light before calculating the shadow ray. The reason is there's always some numerical fuzz in calculating the intersections, and if the point is not offset, the shadow ray might hit the very same polygon again, putting shadows in wrong places. You can see the self shadowing artifacts if you set the setting to zero, and then render the scene. A binary space partitioning (BSP) tree is another way to increase rendering speed. Instead of testing each polygon one-by-one, the objects and polygons are divided into a tree-like hierarchy based on the location in space. The renderer builds multiple trees, one that contains the whole object bounding boxes, and one per object that contains the polygons for that object. The BSP tree takes some time to build and takes some memory. A deeper tree may take longer to build, but may render faster. A shallow tree is faster to build, but may take a long time to render. Controls how many times the scene can be subdivided when building the tree. The tree depth defaults to Auto, and node size to 1. There should be no need to change these settings unless you render a scene that is so huge that Rhino runs out of memory using the default settings. 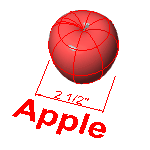 Defines the optimal size for each node that contains the objects or polygons. The transparency bounces setting controls how many times rays that hit transparent objects are traced: 12 means a stack of 12 transparent sheets will render properly, but the 13th sheet will render opaque. To keep the render times reasonable, the limit is 15. The reflectivity bounces setting controls how many times rays that hit reflective objects are traced. To keep the render times reasonable, the limit is 15. Restores all default rendering settings. The RenderOpenLastRendering command opens the last rendering image file (.rimage). The RenderOpenRenderImage command opens a browser window with the recent rendering image files (.rimage). The RenderPreview command renders the current viewport in the render window at render resolution, optimizing render time. The RenderPreviewInWindow command renders a selected area of the current viewport in the render window at render resolution, optimizing render time. The RenderPreviewWindow command renders a selected area of the current viewport in the viewport at viewport resolution, optimizing render time. The RenderReportMissingImageFiles command opens the image manager, which can be switched to show all image files in addition to missing ones. The RenderWindow command renders a selected area of the current viewport in the viewport at viewport resolution. The SaveRenderWindowAs command saves the image in the render window to a file. In the Save Bitmap dialog box, choose the name, location, and file type for the bitmap file. You can save the bitmap in .bmp, .tga, .jpg, .pcx, .png, and .tif formats. Saves an alpha channel if the file type supports transparency. The SetCurrentRenderPlugIn command specifies the current rendering plug-in application. You can download plug-ins from www.rhino3d.com/resources.